Agro-industrial Expert, UNIDO’s Regional Training Workshop for West African Nations (Nov01) – UNIDO Mission in Sustainable Industrial Development for senior staff from Senegal, Cote d’Ivoire, Cameroon, Nigeria, Guinea & Ghana, in Lagos, Nigeria. Seconded as a Project Expert to IDB Jeddah, for a Tripartite Mission, in Project Financing training & consulting for 1998 for staff of TFEB, Ashgabad. Assisted The Bank in project appraisals and consulting in several Presidential decree and high priority projects for international tenders/ joint ventures. Projects include: Modernization of the Turkmenbashi Refinery (US$1.7 bil. ); Ammonia-Urea Fertilizer Plant at Chardzhou-Seidi FEZ (US$250 mil. ); Aluminium Plant at Mary-Bairamaly FEZ (US$430 mil. ); Paper/Pulp Plant at Buizmen-Annau FEZ; Potassium Sulphate (K2SO4) Plant at Bekdash/Kara Bogaz Gol, Caspian Sea; and Bitumen-based Plastomeric/Elastomeric Waterproofing Membranes Plant at Buizmen-Ashgabat FEZ. Malaysian counterpart (Senior Fellow/ Economist) – attached to Agriculture Canada, Vancouver. Assisted in developing a prototype software for land analysis and decision support (LANDS) System, a PC-based LANDS System (Ver.1) for farm/ regional level applications using proprietary softwares. 30Oct03 - Speaker at the Privatisation of Government & State-Owned Enterprises in Malaysia Conference, 30-31 Oct 2002, JW Marriott Hotel, K.L. Feb. 1, 1999 - "Brighter days ahead?" 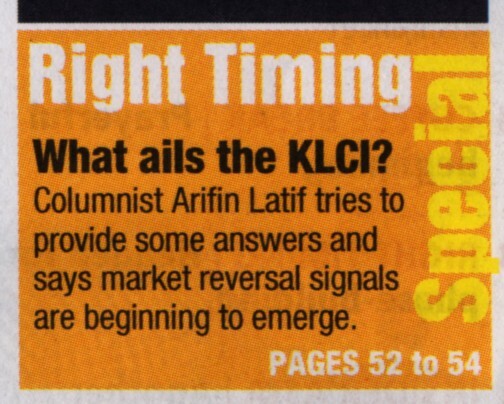 Feb. 14, 2000 - "Spot-on prognosis?" Oct. 2, 2000 - "In Search of the Three Buddhas"
Apr. 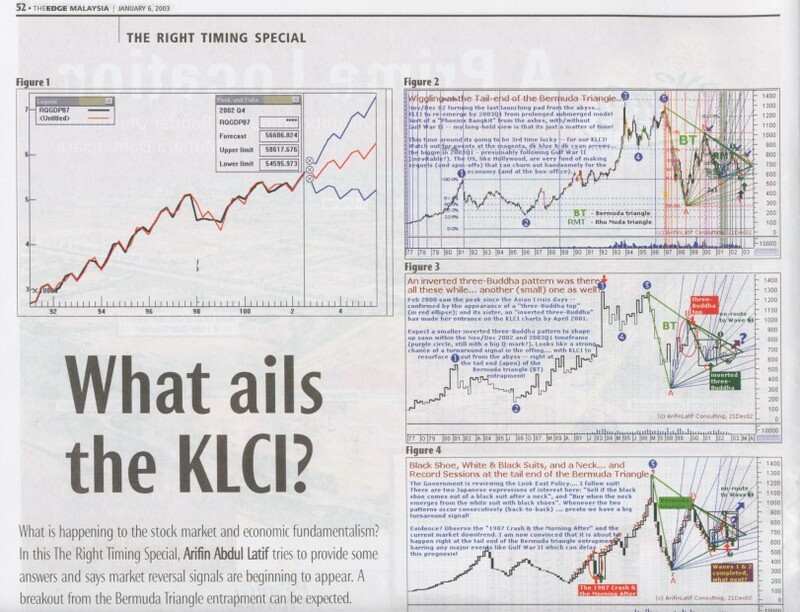 30, 2001 - "In and out of the Bermuda Triangle"
Sep. 3, 2001 - "Breaking out of the Bermuda Triangle"
Aug. 23, 2002 - "Getting out of the woods"
Jan. 6, 2003 - "What ails the KLCI?" Traded in several oil & gold exploration stocks listed on Toronto/ Vancouver Stock Exchanges -- through L.O.M. Western Securities Ltd., Vancouver, Canada. Stocks: Pan Pacific Petroleum, Consolidated Goldwest, Solomon Resources, Adrian Resources & Silver Butte. Traded in several industrial/property trust/oil & gold exploration stocks listed on Sydney/Melbourne Stock Exchanges -- through Hattersley Maxwell Noall & Co., Canberra, Australia. Stocks: ICI, Offshore Oil, Weeks Australia, S.W.Gold Mines, Whim Creek & IEL Property Trust. Dissertation Research for Masters Degree at ANU (1985) Researched on the stock market economics for MADE thesis at ANU, on DEC-10 mainframe computer using SHAZAM econometric packages. Coverage of study from 1967-1983, tested “follow-the-leader” and "leading indicator" hypotheses on price trends of plantation stocks and its relationship to the performance of Malaysia's macroeconomic parameters and prices of major commodities.